The $25,000 Rea Award for the Short Story has been awarded to DONALD BARTHELME. The Rea Award for the Short Story was established in 1986, to honor a writer who has made a significant contribution to short story writing. It is given annually by the Dungannon Foundation to a living U.S. writer.The recipient is nominated and selected by a jury – the award cannot be applied for. Previous winners of the Rea Award for the Short Story are Cynthia Ozick (1986) and Robert Coover (1987). Michael Rea, president of the Dungannon Foundation, says of the winner: It seems right. Barthelme adds considerable heft to the concept of the award; like the other distinguished recipients, Barthelme makes a most significant contribution to the art form. 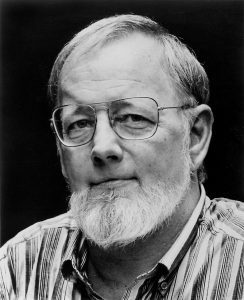 Jurors for the 1988 Rea Award for the Short Story were Benjamin DeMott, Bill Henderson and Cynthia Ozick. Mockery and exaltation regularly co-habit in Donald Barthelme’s stories. The voice of pop sings in sweet mysterious harmony with the voice of traditional philosophical and literary culture, and at moments intuitions of beatitude intrude suddenly on the excruciations of urban life. No richer – or funnier – discourse exists in contemporary American fiction. Perception is like balls of different colors and shapes and sizes that roll around on the green billiard table of consciousness. His short story collections include Forty Stories, Overnight to Many Distant Cities, City Life and Unspeakable Practices, Unnatural Acts.